Let me just say, that “Jack and the Beanstalk” was the first Rabbit Ears story I have seen and it helped introduce me to the series I have come to love so much over the years! “Jack and the Beanstalk” is an ancient English fairy tale that is given a hilarious boot from Michael Palin’s humorous narration, David A. Stewart’s jazzy and mystic music and Edward Sorel’s scratchy yet beautiful illustrations and it will definitely be an instant treat for many children around the world! This is like the most graphic yet hilarious description about a burp that I have ever read! Parents should know that the ogre might scare young children especially when he threatened to eat Jack a couple of times. Parents might want to reassure their children that ogres do not exist in real life and this tale is simply a fairy tale. 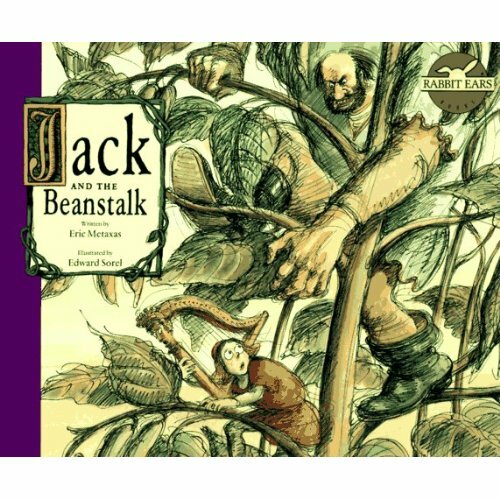 Overall, “Jack and the Beanstalk” is a true classic fairy tale that every child will easily enjoy for many years! I would recommend this video to children ages five and up since scenes with the ogre might scare smaller children.